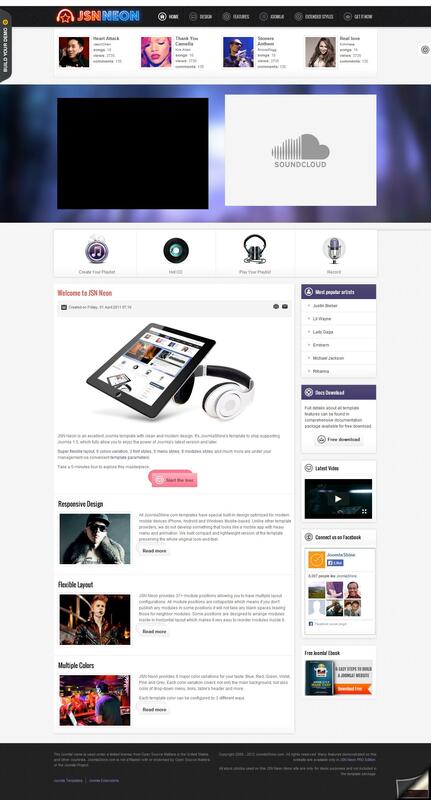 JSN Neon - this is another product of the studio JoomlaShine, intended for developers of sites with musical content. Included with the template are 6 different decorations, differing colors. Besides the basic modules such as menu with animation, audio recordings and top lists of the most popular performers, template contains a lot of other, which can be positioned anywhere on the screen due to the presence of more than 50 convenient positions. One of the tangible advantages template is its flexibility, which makes it easy to understand it is not only for advanced users but also for beginners. Template works correctly in all known browsers, and its open source code and optimized, which facilitates the work of the search engines.